Swipe shortcut: Swipe a Tweet in your home timeline to reply to, retweet, favorite or share it, or view the Twitter user’s profile, without leaving your timeline. “Find friends”: We’ve added a confirmation alert when you select “Find friends”. This notification more clearly and explicitly messages the fact that when you upload your contacts’ email addresses and phone numbers, you can quickly find which of your friends are on Twitter (that is, if they’ve chosen to be discoverable by email or phone number). New devices: Twitter for Android is now optimized to run on Android devices running Ice Cream Sandwich, as well as on the Kindle Fire (available today through the Amazon Appstore) and the Barnes & Noble NOOK Color and NOOK Tablet (available February 23 though the Barnes & Noble NOOK Store). Basically, global changes include a minor gesture feature, plus a disclosure that Twitter will be uploading your contacts to their servers if you use the "Find friends" option. But if you're on Android 4.0, something much more important has changed: hardware acceleration. 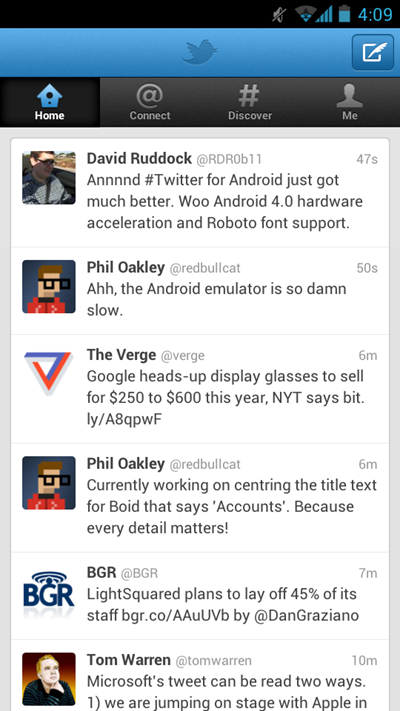 Oh yes indeed - if you're on Ice Cream Sandwich, you'll notice the Twitter app is now buttery smooth, just as it always should have been. In addition, Robot font support has been added, so it's a whole lot more readable now. Kindle Fire owners can now use the official Twitter app as well, downloadable via the Amazon Appstore.